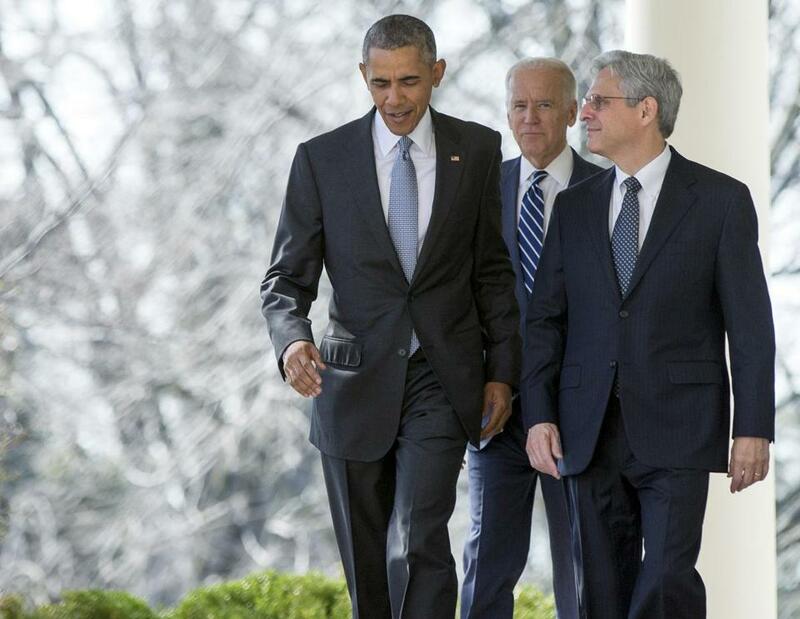 Federal appeals court judge Merrick Garland (right) walked with President Barack Obama and Vice President Joe Biden from the Oval Office to the Rose Garden to be introduced as Obama’s nominee for the Supreme Court on Wednesday. The fact that Merrick Garland clearly meets the criteria for the Supreme Court ought to be enough to ensure he gets hearings and a vote, despite Republican promises to bottle up President Obama’s nominee until he leaves office. The fact that Garland is closer to the center – and older – than anyone a President Hillary Clinton is likely to nominate ought to be enough to give Mitch McConnell second thoughts about his unprecedented, outrageous obstruction strategy. Garland, an appellate judge, is eminently qualified. Before President Bill Clinton appointed him to the Court of Appeals for the District of Columbia Circuit in 1997, he had established an impressive record as a federal prosecutor in a number of high-profile criminal cases, including the Oklahoma City bombing. He’s also older, at 63, meaning he’s less likely to spend decades on the bench. Republicans don’t object to his qualifications — how could they, when senior GOP senators are already on record praising him? Rather, McConnell is sticking to the preposterous argument that no Obama nominee should get hearings or a vote and that the next president should fill the seat opened by the death of Antonin Scalia. There is no precedent for such a demand, and the GOP’s stance is an insult to the voters who elected President Obama for a four-year term. But Garland’s nomination also points out the obvious strategic dangers for the GOP if it sticks to its guns. If Clinton is elected, there is no guarantee she would renominate the moderate Garland. With the opportunity to shape the court, Clinton might well pick a nominee who’s younger, further to the judicial left, or both. And even if the GOP still controls the Senate next year, it’ll be hard to pivot from insisting the next president choose the nominee to opposing Clinton’s choice (which is not to say the seemingly shameless McConnell might not try). And who knows what Donald J. Trump would do? He solidified his position as the front-runner for the GOP presidential nomination Tuesday, winning another four states. Republican strategists haven’t given up their search for a Hail Mary to block Trump, but the only ways to stop him now involve fanciful brokered-convention strategies. Like most of his other views, Trump’s philosophy on the judiciary is unknown. Is McConnell sure it’s worth the risk involved with sabotaging Garland, just to hand the power to pick the next justice to Trump? Senators who have backed McConnell’s stance, including Iowa’s Chuck Grassley and New Hampshire’s Kelly Ayotte, also need to reconsider. Both are running for reelection in swing states. As it was, their refusal to consider Obama’s nominee was a disservice to their own constituents, who picked Obama in 2012. Now their failure to repudiate Trump, coupled with their insistence that the next president choose Scalia’s replacement, looks an awful lot like an endorsement of Trump’s fitness to pick the next justice.